When God created the Sunflower, the world received an angel of joy and strength. Sunflowers represent power, fortitude, potential, joy and happiness. Let’s explore together Sunflower’s major features and see what they tell us about her vibrational stylings. When taking a peek into a flower’s world, we can look at her colors to help us receive the energy she is sharing with us. The color yellow vibrates to the solar plexus chakra, which relates to willpower, strength and confidence. The beautiful golden yellow color of the sunflower charges up our power center so that we are filled with the energy and confidence to create our world and accomplish our dreams. When we are filled with the loving vibration of Sunflower’s color, we are not only charged with the confidence to use our power, but the loving wisdom to use this power for good. True power is always in service to goodwill and harmony; true power is always in service to God. 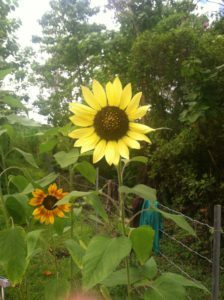 Although we have free will, and can develop our willpower through an assortment of activities and substances, sunflowers share that will power alone is not enough to develop the true potential of power. When we use our free will to cultivate good will (God’s will), here is where we find true power moving through us. The color also yellow fills us with joy and connects us with our inner child and play. When we give ourselves the time to play and connect with our innocence, we feel good about ourselves, and naturally cultivate confidence and self acceptance. Sunflowers grow tall and sport a large circular center surrounded by a crown of bright petals. With her face-like features and person-like height, we relate to sunflowers on a personal level. They grow fast and full and offer the abundance of their nutritive seeds. 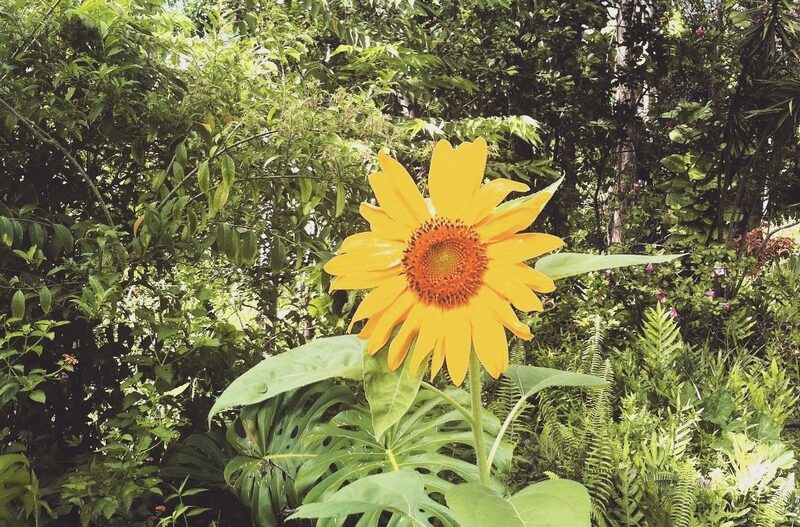 If a sunflower were a human friend, she would be one that brightened your day, shared a smile, filled you with positive energy and fed you a nourishing meal. Her height can tell us about moving and growing with the light and taking great strides in life. The shape of her center can tell us about fullness, cycles, and completion. The design of her seeds decorating her face shows us the intricate perfection of energy in motion, the energy of creation. Connecting with Sunflower energy may result in lightening up, thinking good thoughts, and beaming our joy through our shining eyes and smile. Side effects may include developing the arc line and spending time engaged in activities that bring joy and good will to yourself and others. Find a comfortable seated position. Take several long deep breaths and begin to settle your mind and body. When you feel centered, close your eyes and begin a slightly slower than normal breathing pattern . Conjure an image in mind of a sunflower. Imagine her standing tall in front of you. Create in your mind a yellow glow around her. Imagine that this yellow glow that emanates from her gets bigger and bigger until the yellow glow is all that you can see. Allow this glowing light to reach you. Take it in as much as you can. With eyes closed, raise your hands in front of your heart and scoop up this golden light, bringing your hands back to your heart. Continue to scoop and fill your heart until you too start to feel encompassed in golden yellow light. Imagine the energy in your heart radiating outward, fueling your entire body with love and joy. Now see if you can project the light. Watch as golden yellow light shining from within you reaches further and further outward. Can you fill the room? How about the entire house? Can you expand the light beyond the confines of walls, out beyond the sea, around the entire world? Can it go even further still? Out into the Milky Way and beyond, into the void of space and time? Return awareness to the breath. Taking a deep breath in, tune into the radiance you have cultivated. Exhaling, extend radiance out into the world. Repeat for five breaths. Gently open your eyes, wiggle your toes and fingers, and shift your awareness back to your body, feeling your legs gently touching the floor. Smile and feel your heart lifted as if attached by strings to the corners of your mouth. Move about your day with grace and joy! What small act can I do to brighten someone’s day today? Did you enjoy reading this? I am always thrilled to hear your comments and thoughts. Mahalo for being here with me! I do agree with you. nice article. thank you for sharing.